#1 Aren't those pins so cute! They're from Just Peachy. 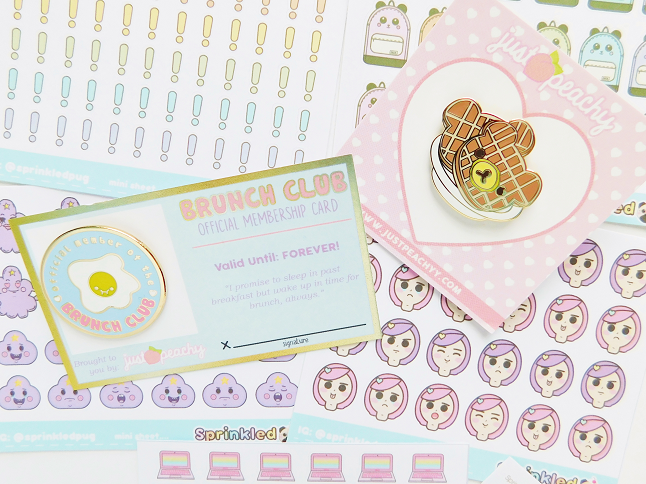 The Brunch Pin comes with a membership card which is such a cute idea! #2 I received my first Bonne Chance Collection in the mail this week! I've always been a fan of their dresses because they're so cute! I was tempted to buy more than one dress but I wasn't sure how the fit of the dresses would look on me so I only bought one, the shark cutout dress. You can read my review on the dress here. #3 My latest addiction is the Tsum Tsum app game. I go through phases where I'm obsessed with the game and it started last weekend. Does anybody else play? #4 On Tuesday Disney released the Sleeping Beauty Tsum Tsum collection. I regret not getting the Sleeping Beauty pack because it sold out in hours! #5 My sister and I have been recently watching Drake and Josh on Hulu. I was never a huge fan of the show but it's funny to see my sister crack up while watching the show. #7 The new season of Unbreakable Kimmy Schmidt was released today! Guess what I will be doing over the weekend? The sad thing about me collecting pins is that I don't even use them for anything special I just keep them displayed on my dream board. The artwork is so cute though! Those pins are so incredibly cute! Just had to go on their website, I'm so sad the 'May All Your Bacon Burn' pin is sold out - you always find the cutest things.